iOS 9 was introduced during Apple's Worldwide Developers Conference on June 8, 2015 and was released to the public on September 16, 2015.
iOS 9 introduced a new system-wide feature providing Proactive assistance was introduced, though Siri and advanced search, users are now presented with contextually aware information. The Notes app within iOS 9 received notable (pun intended) updates now with the ability to add photos, hand-drawn sketches, different fonts within a note. 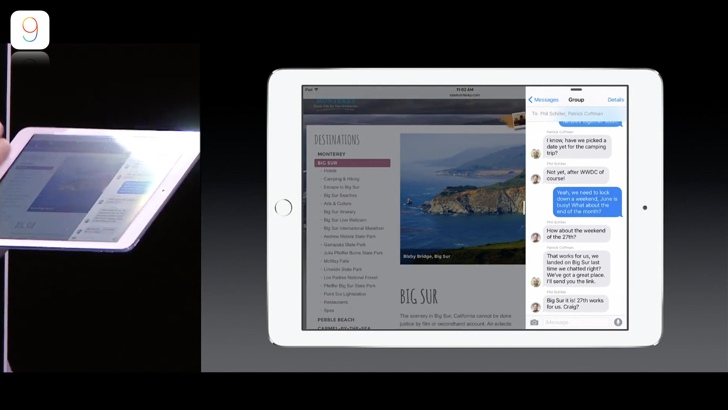 The iPad multitasking experience improved by introducing Slide Over, Split View and Picture in picture. 3D touch introduced providing ‘peek’ & ‘pop’ functionality. Night Shift introduced, making the display color warmer for more comfortable viewing. • When enabled, Night Shift uses your iOS device’s clock and geolocation to determine when it’s sunset in your location, then it automatically shifts the colors in your display to the warmer end of the spectrum and may even help you get a better night’s sleep.